Meet Sammy. This cute little peanut butter and jelly sandwich is actually a robot that teaches coding principles and skills to children in grades K-2. You don’t need a tablet, smartphone, or computer to program this robot; programs are created by simply laying down a sequence of physical code cards. As the robot drives over the code cards, an OID optical scanner on the bottom of the robot reads the code cards one by one and loads the program. Next, place the robot on a grid made of map cards, and the robot runs the program. You can program the robot to move in different directions, activate its output gear, light up its LED, play sounds, and respond to different function cards. The integrated output gear makes it possible to build simple robotic creations with arms or other moving parts that respond according to the program’s instructions. 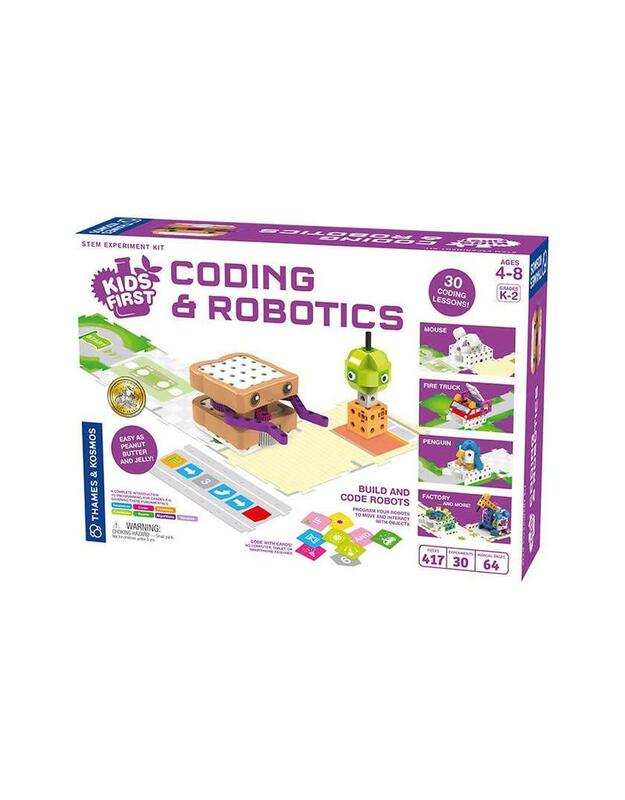 This robot kit also teaches physical engineering and problem solving skills through a series of building and coding lessons. The 30 lessons are aligned with standards for computer science education developed by the Computer Science Teachers Association (CSTA) and the International Society for Technology (ISTE) Education, as well as courses from Code.org. The lessons progress in complexity through the illustrated manual, allowing the kit to be appropriate for a child as young as four years with help from an adult and as old as eight years. 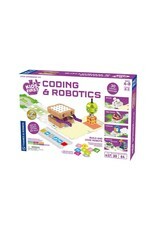 The lessons cover these six key areas in coding: sequencing, loops, events, conditionals, functions, and variables. In addition to Sammy, there are five other stories, each with a series of model-building and coding challenges and lessons related to it: a mouse moves through a maze to find cheese; a penguin wanders around a zoo; a soccer player moves a ball into the goal; a fire truck puts out a fire; and a factory robot performs tasks in a factory scene. A full-color illustrated manual guides users through the coding lessons and the assembly of the different models.